Users of Ubuntu will be very aware of the Ubuntu Software Center and its shortcomings. Indeed as from Ubuntu 16.04 the Software Center is due to be retired altogether. A great alternative to the Software Center is the Synaptic Package Manager. 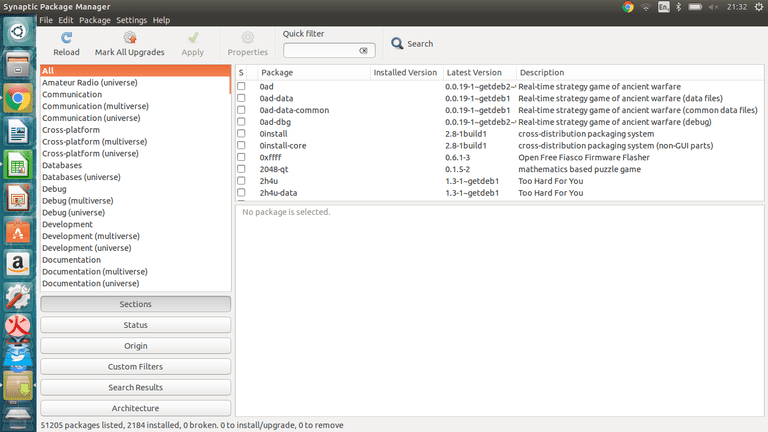 The Synaptic Package Manager has many benefits over the Ubuntu Software Center such as the fact that there are no adverts for paid for software and the fact that you will always see the results from all the repositories within your sources.list. Another benefit of Synaptic is that it is a common tool used by many other Debian based Linux distributions. If you get used to it using Ubuntu then should you decide to switch distribution later on then you will have a tool that you are already familiar with to aid with the installation of other applications. If you are using Ubuntu you can use the Software Center to search for and install Synaptic. The user interface has a menu at the top with a toolbar underneath. There is a list of categories in the left pane and in the right pane a list of applications within that category. In the bottom left corner is a set of buttons and in the bottom right corner a panel to show the description of a selected application. Reload – The "Reload" button reloads the list of applications from each of the repositories held on your system. Mark All Upgrades – Mark all upgrades marks all the applications that have available upgrades. Apply – The Apply button applies changes to marked applications. Properties – Properties provides information about selected applications. Quick Filter – Quick Filter filters the current list of applications by a chosen keyword. Search – The Search button brings up a search box which lets you search the repositories for an application. The buttons at the bottom of the left panel change the view of the list at the top of the left panel. The sections button shows a list of categories in the left panel. The available categories far outweigh the number in other package managers such as the Software Centre. Without going through them all you can expect to see categories such as Amateur Radio, Databases, Graphics, GNOME Desktop, KDE Desktop, Email, Editors, Fonts, Multimedia, Networking, System Administration and Utilities. The origin button brings up a list of repositories. Selecting a repository shows a list of applications within that repository in the right panel. The Search Results button shows a list of search results in the right panel. Only one category will appear in the left panel, "all." Clicking on a category in the left panel or searching for an application by keyword brings up a list of applications in the top right panel. To install or upgrade an application place a check in the box next to the application name. Click the apply button to complete the install or upgrade. You can of course mark a number of applications at once and press the apply button when you have finished making selections. Clicking on an package name shows a description of the application in the bottom right panel. If you click on an application and then the properties button a new window appears with the following tabs. The common tab highlights whether the application is already installed, show the package maintainer, the priority, the repository, the installed version number, the latest version available, the file type and the download size. The dependencies tab list the other applications that need to be installed for the selected package to work. The installed files shows the files that are installed as part of a package. The versions tab shows the available versions of the package. The description tab shows the same information as the application description panel. The search button on the toolbar brings up a little window with a box where you enter a keyword to search for and a dropdown to filter what you are searching on. Generally you will search by description and name which is the default option. If after searching the results list is too long you can use the quick filter option to filter the search results further. The File menu has options for saving marked changes in the file system. This is useful if you have marked a number of packages for installation but you don't have the time to install them at the moment. You don't want to lose the selections and have to reselect them later. Click "File" and "Save Markings As" and enter a filename. To read the file back in later on select file and "Read Markings." Choose the saved file and open. There is a generate package download script option available on the file menu. This will save your marked applications in a script which you can simply run from the terminal without having to reload Synaptic. The Edit menu basically has similar options to the toolbar such as reload, apply and mark all applications for upgrade. The best option is fix broken packages which attempts to do exactly that. The Package menu has options for marking applications for installation, reinstallation, upgrade, removal and complete removal. You can also lock an application at a particular version to prevent it upgrading especially if you need certain features removed from newer versions or if you know the newer version has a serious bug. The Settings menu has an option called "Repositories" which brings up the Software and Updates screen where you can choose to add extra repositories. Finally the Help menu has a comprehensive help guide showing anything that is missing from this guide.